Tlemcen is a medium-size city of 140000 inhabitants, located in the Atlas mountains at 800m of altitude, 160km southwest of Oran and 60km inland from the coast. Due to its long and rich history Tlemcen has a multitude of ancient buildings and mosques, making it a very interesting place to visit. 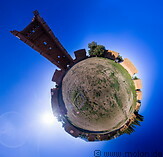 Founded by the Romans in the 2nd century AD as the military outpost of Pomaria, Tlemcen grew over the years and became the capital of the Tlemcen kingdom in the 13th century. At the peak of its power, in the first half of the fourteenth century, Tlemcen had 40000 inhabitants and was a wealthy regional trading centre. Nowadays Tlemcen is a pleasant, laid back city with a beautiful historic core centered around the El Mechouar palace and the Grand Mosque, with tree lined boulevards and cafes and shops. The Mansourah minaret is located slightly out of the city centre and is a very photogenic spot. 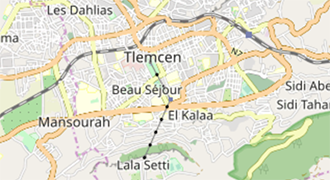 Tlemcen is two hours by car or bus from Oran and has its own airport with connections to Algiers and Paris. It also has a train station with trains to Oran. 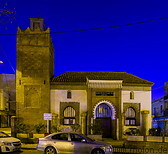 Tlemcen has several hotels, some of them bookable via online booking portals.